Owen P. Wickham was a contractor with the firm Wickham Bros. Construction Co. He was also a brick manufacturer. The house was built for O.P. and his wife Cecilia. 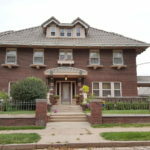 It is a Queen Anne/Eastlake style house with concrete trim and features outstanding Victorian woodwork on both the interior and exterior. O.P. and James Wickham, built many of the brick streets and commercial buildings in and around Council Bluffs. Their work was seen at the Grand Hotel, the original Pottawattamie County Courthouse and St. Francis Zavier and St. Peter Catholic churches. 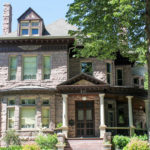 The house, built of Sioux Quartzite from Jasper, Minnesota, in 1887 in the Richardsonian Romanesque style for attorney Finley Burke and his wife Parthenia. Burke was an attorney for the Chicago and Northwestern Railroad. German carpenters finished the interior and today it still retains its impressive character and finish. After Burke’s death in 1903, his widow sold the house to John G. Woodward and his wife, Hattie. Woodward was the founder of the John G. Woodward and Co., one of the largest candy companies west of the Mississippi. 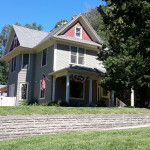 The house was designed by J. Chris Jensen and built in 1908 for Frank Everest and his wife Florence (Folsom) Everest. Frank was president of Greenshield-Everest Real Estate Company and president of First National Bank. The Tudor Revival style house retains the original walnut paneling in the foyer, walnut trim in the living room, and oak woodworks, a built-in cabinet and wainscoting in the dining room. This was the boyhood home of Frank and George Everest, who became generals. Johnny Johnson owned the land from 1867 to 1887, but there is no indication the Johnsons ever lived in the home still standing on the site. Originally small, with five rooms, the initial part of the Victorian cross-gabled house features intricate wood trim, all original. 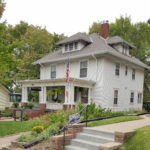 After falling into disrepair, the home was restored, with the damaged floors on the main level replaced with flooring from the print shop at the Omaha Stockyards. Richard Mossman’s home was built in 1911 from a Sears Roebuck kit (Craftsman) – a very popular practice in areas served by a rail line. The owner could construct it from detailed instructions or hire someone to build it. Once converted to apartments and, later, a museum, it once again is a single-family home. 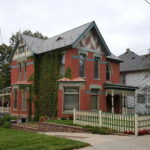 This home was built for Charles and Edith Officer. Charles had his own firm on Broadway, dealing in real estate, loans, rentals and insurance. This house was built for John & Charlotte Bennet. John Bennett was one of Council Bluffs’ earliest settlers. Bennett served as county treasurer, county auditor and alderman. In 1888, he became head cashier for the State Savings Bank. 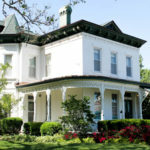 The house has maintained much of its original condition and features beautiful interior molding and fireplaces, frosted glass doors, an ornate staircase and many period appropriate light fixtures. 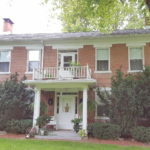 This home was built for Thomas and Emma Cavin. Thomas Cavin was owner of several mercantile stores and, finally, floor manager for the John Beno Co. Once converted to apartments, the home has been restored to a single family home. Fred R. Davis was president of Pioneer Implement Company. It was later the home of Marie and L. C. Bussey, owners of Broadway Cleaners, for more than 30 years. 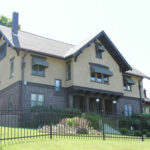 Once known as the Girl Scout office, the house is now a single family home. Located near the Historic General Dodge House. 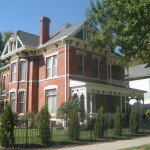 The McDonald-Sylvester House is one of the oldest known homes in Council Bluffs. Its Greek Revival architecture was popular in the United States during the pre-Civil War years, in commercial buildings and in the large homes in the southern coastal states. The McDonalds named the property “Rosegien.” McDonald and his wife, Adelphia, took in school teachers as boarders. One was William H. Kinsman – teacher, lawyer and Civil War hero. Another was John A. Sylvester, whom Adelphia married after the death of her husband, Milton. This house was built for Vincenzo and Carolyn Chiodo. 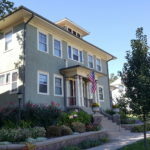 The house features lots of stained glass, marble salvaged from the old Omaha courthouse and original mahogany woodwork. The house served as the Italian Consulate during the 1920s and 1930s. Chiodo was born in Adami, Italy, in 1870. He arrived in Omaha in 1884 at the age of 14. In the early part of the 20th century, the U.S. census listed his occupation as “Ladies Tailoring”, and later, “real estate.” He owned 50 rental properties and built several apartment buildings which are still standing. By 1929 he was rated Omaha’s only Italian millionaire. He entertained many influential people in his home. Whether you will be a returning guest or a new participant, we welcome you to dine with us in one of next year’s historic homes.